Section headings and papers: Introduction. Strategic planning for public service and non-profit organizations, J. M. Bryson. The Strategic Planning Process. A strategic planning process for public and non-profit organizations, J. M. Bryson. Strategic Planning in Local Government. Making strategic planning work in local government, R. W. Rider. Planning for strategic performance in local government, R. McGill. Strategic Planning in State Enterprises. Why planning in state enterprises doesn't work, M. Javidan & A. Dastmalchian. Strategic management of public and non-market corporations, J. Ruffat. Strategic Management of Projects. Planning development projects: lessons from developing countries, D. A. Rondinelli. How NASA moved from R & D to operations, J. L. Hunsucker et al. Strategic Planning in Non-Profit and Voluntary Organizations. Strategic planning for the world wildlife fund, G. J. Medley. Managing Participation. Participative planning for a public service, T. Grewe et al. Futures research - working with management teams, D. Sims & C. Eden. Additional Tools. Foresight activities in the USA: time for a re-assessment, L. L. Lederman. Realistic planning for transportation - a flexible approach, A. M. Khan. 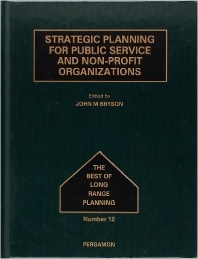 Strategic Planning for Public Service and Non-Profit Organizations is the 12th volume in the Best of Long Range Planning Series and focuses on strategic planning for public and non-profit purposes such as government, public agencies and non-profit or voluntary organizations. The book also addresses how strategic planning differs from other kinds of planning and how strategic planning for public and non-profit purposes can be tailored to fit differing circumstances. For those working in planning and public affairs, management consultants, and academics and researchers of strategic planning and strategic management.